On Halloween weekend, Friday could be fright night for Saints. But Stephen Myler doesn’t want to see it that way. Instead, he wants to see it as fight night as his team prepare to square up to Gloucester. There was a steely determination in the fly-half’s voice and eyes as he spoke about the game that lies ahead. After last Saturday’s evisceration at Stade Pierre Antoine, where Castres ran in five tries ina crushing 41-7 Champions Cup victory, Saints need a huge reponse. 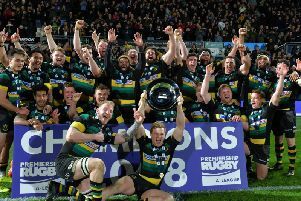 Nothing less than a victory will do for the Franklin’s Gardens faithful, who are growing restless with the team’s poor start to the season. Three wins from eight matches in all competitions is nowhere near good enough for a club that expects to be competing with Europe’s best. And Myler said: “We were really disappointed last weekend. “It was not a good result, not a good performance and going all that way to come out with that was very frustrating, to say the least. “It was one of those games where nothing seemed to go our way, but we need to put it right this week. “We have got a good opportunity and we have been saying all the right things and trying to work hard to turn it around. As fans will point out, actions speak louder than words. And the only way anyone will know whether Saints can pull this around is by actually seeing them do it. “We know we can put it right,” said Myler. “But we can’t be 10 per cent off our game because we know what will happen. “We have to use this to galvanise us. “We know we are going to suffer defeats along the way, but it’s the performance that disappointed us most last weekend. “We all know we can do better but it is important to stick together as a unit because we can’t do it on our own. “Rugby’s not an individual game - it’s a team effort and it’s all about how the team performs better. Gloucester have endured a similarly sluggish start to the season, winning just one of their Premiership games. And the Saints supporters will expect nothing less than a victory. “We get frustrated and the fans will get frustrated if we’re not performing how we can, but it doesn’t change our attitude going forward,” Myler said. “We want to put everything on the line to come out with a victory on Friday night, and I’m sure all of the fans will be right behind us no matter what. “That’s the kind of message and feeling we get from them - they are second to none. “I’ve been here long enough to know that the support is always there and we do need it, and it does make a huge difference. I’m sure it will be there on Friday. Myler was the hero of the hour last time out at the Gardens, landing a last-gasp penalty to see off Montpellier. And he said: “It was nice being involved in the game against Montpellier because there was a buzz around it.